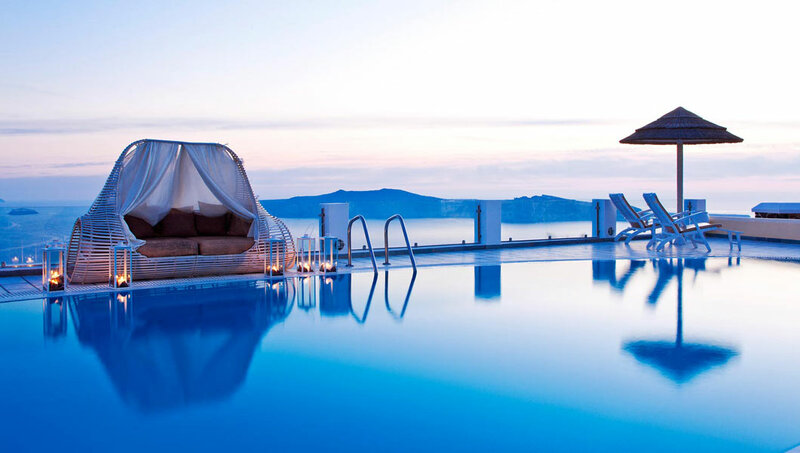 The Santorini Princess Luxury Spa Hotel, is only 3,5 km away from the capital city of Fira. It is a new hotel, built in 2004, following the traditional cycladic architecture, with a single purpose to offer its guests modern convenience and service of high quality. Santorini Princess has 22 fully equipped luxurious apartments for 2, 3 or 4 persons. All the rooms, including the bathrooms and the balconies, have marble floors. In Imerovigli, the most beautiful village of Santorini, you will find Santorini Princess Luxurious Hotel Apartments. It is situated on the enchanting and world famous caldera, 300m above the sea, having the most fascinating and unique view of the volcano and the little islands of the Aegean Sea, and of course the breathtaking sunset. The hotel is fully air-conditioned and tiled with marble. There are just a few stairs leading to the hotel, facilitating easy and convenient access. An abundance of parking spaces can be found just outside the hotel area. Views of the Caldera and the sunset are offered from all areas of the hotel. Santorini Princess coordinates wedding receptions, parties and other social functions in the a \'la carte restaurant and the open-air lounge.